Last month, I shared that one of the top-tier publications I've been trying to break into extended a rewrite request on my latest submission. 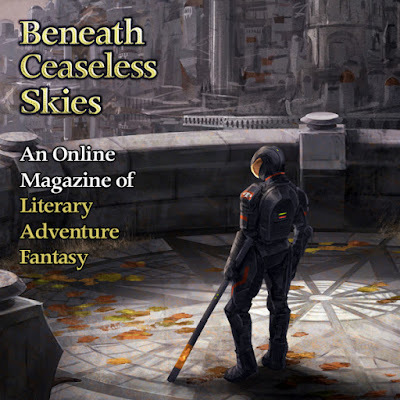 Now that the edits are done and the contract is signed, I can divulge more details: The publication is Beneath Ceaseless Skies -- a pro-paying, SFWA-qualifying, Hugo-nominated venue -- and after seven years of knocking on their door, I am super-stoked to have them finally accept one of my stories. The other eight submissions I've sent since 2010 were kindly rejected each time with a line or two stating what the editor liked about them, but they were never a good fit. Mainly because my fantasy often leans toward science fiction, and BCS doesn't publish sci-fi. Except when they publish their special science-fantasy annual issue, which is where “The Last Human Child” will appear next year. While this story continues the arc of the previous four Dahlia & Brawnstone tales (published by Aoife’s Kiss, Triangulation: Morning After,The Fifth Dimension, and Perihelion Science Fiction), it's also a standalone that can be enjoyed by itself. Eyan the shapeshifter makes a reappearance, but the cast of supporting characters is unique to this story, and the worldbuilding of the earlier stories is expanded to include new friends and foes on the scene. I enjoyed crafting every line of "The Last Human Child", but I also appreciated working with editor Scott H. Andrews to fine-tune it, going through a couple rounds of edits before we agreed it was good to go. Usually editors at this level aren't so hands-on; they’re flooded with thousands of stories every month, and they can afford to accept only the submissions that encapsulate exactly what they're looking for. In this case, BCS could have responded like so many other top-tier publications have over the years: “There’s a lot here that I liked, but in the end, it didn't win me over, I'm afraid.” Instead, this editor took the time to help me identify my story’s weak moments, strengthen them, and end up with a tighter story overall. And as if that wasn't enough, he paid me generously for my efforts. What a deal! I can't wait to share it with you. As soon as the BCS science fantasy issue is out, you'll hear me shouting about it from a nearby rooftop.